Secretariat Jockey – Ron Turcotte inspecting the initial maquette. 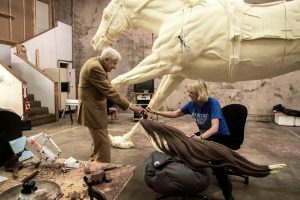 By autumn, the Secretariat coming to life at a sculptor’s Oklahoma studio will stand larger-than-life in bronze at the traffic circle in Lexington where Alexandria Drive meets Old Frankfort Pike. City, state, and federal governments along with the Triangle Foundation of Lexington are combining to bring a sculpture of the horse and a parking/viewing area to the intersection, where traffic counts, last taken in 2016, show 9,195 vehicles passing daily on Alexandria Drive and 3,642 on Old Frankfort Pike. This newest Secretariat memorial will be slightly more than 1 1/2 times the size of Secretariat when he lived. 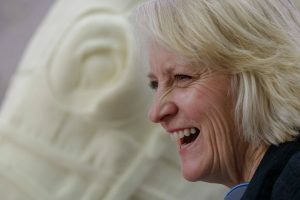 Jocelyn Russell used the maquette sculpture she created as a guide for carving details into the enlarged foam version of the Secretariat monument. “We would have gone to 1 3/4 size if we’d had to,” said Alex G. Campbell Jr., founder of the Triangle Foundation, saying his group wanted its memorial to be the largest so it could be easily seen on the drive up Old Frankfort Pike or across Alexandria Drive. 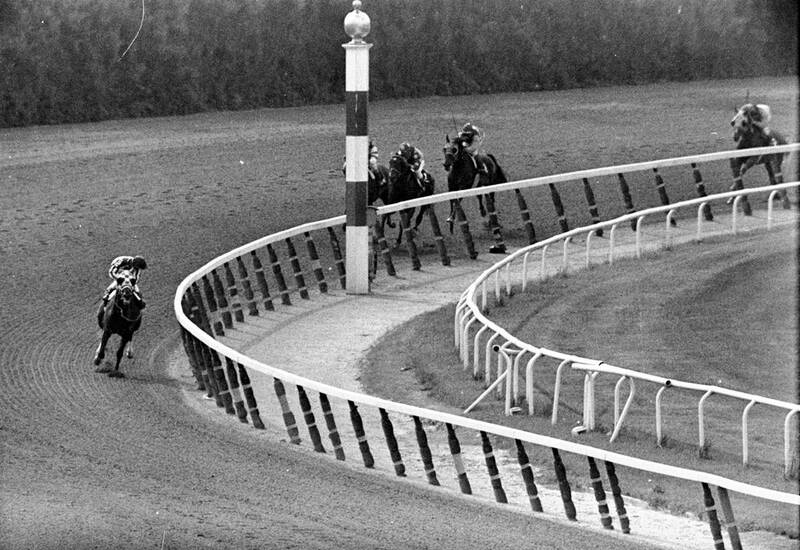 Secretariat, posed in full stride winning the Kentucky Derby as starter No. 1A with Turcotte in the saddle, will be delivered to Lexington probably in late September, riding upright on a flatbed trailer from Oklahoma. The bronze will be held in place on the flatbed with straps stretched across the horse’s body. Organizers are hoping for a dedication in October, possibly to coincide with the Keeneland race meet. Leonard Lusky, founder of Secretariat.com, said he is hopeful Turcotte might be able to attend. Jocelyn Russell carved details in the foam monument. Russell extensively studied horse anatomy and used a large library of historic images to shape every detail for the monument. The sculptor is Jocelyn Russell of Friday Harbor, Wash., assisted by her husband, Michael Dubail, a master welder. Russell also sculpted the Kentucky Horse Park’s bronze memorial to Sergeant Reckless, a mare who filled a significant role assisting the U.S. Marine Corps during the Korean War. Russell specializes in sculpting wildlife and other animals. In 2017 she completed a major project for the entryway to Audubon Zoo in New Orleans, sculpting 15 animals including five life-size elephants and five life-size lions. The elephants rode to New Orleans from Norman the same way Secretariat will travel to Kentucky: standing upright on a flatbed trailer. The Triangle Foundation, which is funding the bronze memorial and accompanying landscape features designed by Barrett Partners, Inc., has not disclosed its cost. A $300,000 figure for both a sculpture and landscaping inside the roundabout was cited in 2012 when the neighborhood organization called Lexington-Frankfort Scenic Corridor, Inc., first looked into improving the site. The nearby viewing and parking area, which will not be Triangle’s responsibility, will cost $753,900. Of that amount, the federal Transportation Alternative Program is contributing $603,120, the Lexington-Frankfort Scenic Corridor, Inc., is contributing land valued at $58,500, and the Commonwealth of Kentucky is contributing $92,280. Jocelyn Russell, sculptor of the Secretariat monument, did six months of researching Secretariat before creating the first design. Russell also sculpted the Kentucky Horse Park’s bronze memorial to Sergeant Reckless, a mare who filled a significant role assisting the U.S. Marine Corps during the Korean War. The Triangle Foundation is funded with private donations and has an impressive record of beautifying public spaces in Lexington. The foundation’s initial project was to fund the design and construction of Triangle Park across from the Lexington Center. The foundation brought the skate facility to Woodland Park. It funded the design and construction of Thoroughbred Park, noted for its life-size racehorse statuary. The foundation also was responsible for Equestrian Park, a small space featuring a trio of bronze horses and their handlers at Blue Grass Airport between the terminal and car rental parking area. Secretariat and jockey Ron Turcotte posed in the winner’s circle after the 1973 Kentucky Derby at Churchill Downs in Louisville. Holding on at left was groom Ed Sweet. 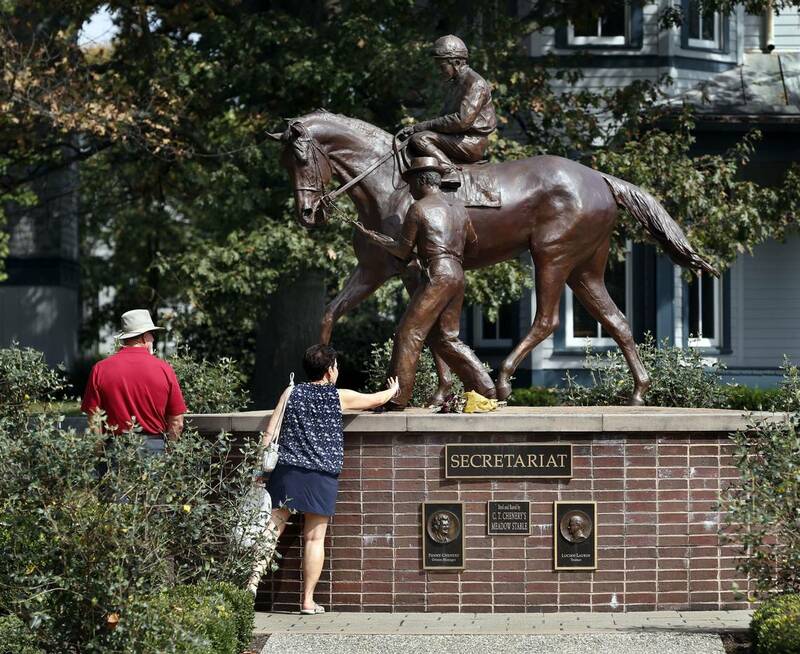 Campbell said he encouraged the Triangle Foundation’s executive committee to choose Secretariat as the horse to be memorialized at the traffic circle. Campbell was building on an idea that the late Don Ball, home builder and owner of Donamire Farm, had made to the Lexington-Old Frankfort Scenic Corridor, Inc. The neighborhood group’s president, Tracy Farmer, said Ball’s idea was to put a horse of some sort at the center of the roundabout. This Secretariat sculpture is one of two at the Kentucky Horse Park in Lexington and one of five known Secretariat monuments. 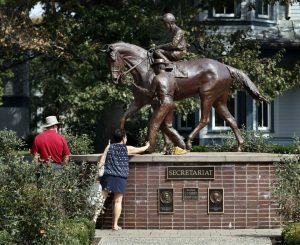 The others are at Belmont Park in Elmont, N.Y., at the National Museum of Racing and Hall of Fame in Saratoga Springs, N.Y., and in Grand Falls, New Brunswick, Canada, home of Secretariat’s jockey, Ron Turcotte. The new bronze coming to Lexington will be the largest. The designation of greatest North American racehorse is controversial and always has brought two others into the debate: Man o’ War and Citation. Man o’ War, born in the month before the United States entered World War I and memorialized in a larger-than-life bronze memorial at the Kentucky Horse Park, did not race in the Kentucky Derby. He did, however, win 20 of 21 races in 1919 and 1920, a number of them in world-record time. Citation won the 1948 Triple Crown and would be the last to win that series until Secretariat. Secretariat was hugely popular and so welcome on the sports scene that he made the cover of Time magazine in 1973. A generation following his racing career he was the subject of a movie released in 2010, called “Secretariat,” directed by Randall Wallace. Diane Lane played Penny Chenery, the erstwhile housewife who stepped forward upon her father’s illness into the prevailing man’s world of her era to head the family’s Meadow Stable in the horse’s ownership. 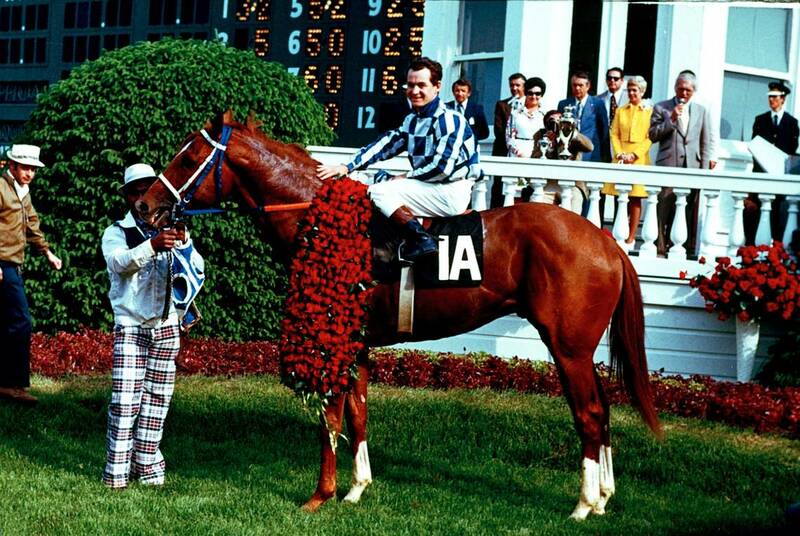 Secretariat died of laminitis, a painful hoof disease, in 1989 at age 19. Claiborne Farm in Paris, where he stood at stud, buried his entire body even though the customary practice in Kentucky is to bury only a horse’s heart and hooves. On one of several research trips to Kentucky to learn more about Secretariat, Russell, the sculptor, sat by his gravestone where she said she felt a powerful connection to the horse. Since mid-November she has been working in her temporary studio at Norman to interpret this emotional connection into a bronze monument that all will recognize as Secretariat. She made two trips to Grand Falls, New Brunswick, to consult with Turcotte so that every buckle on the horse’s equipment and every wrinkle on the jockey’s boots would be in their proper place. She also visited the horse’s Meadow Stable birthplace at Doswell, Va. Her sculpting process has taken her through a number of phases to produce the larger-than-life Secretariat and Turcotte. 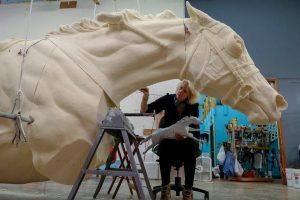 She first crafted a 10-inch miniature followed by a 29-inch maquette, a small clay version of the sculpture that by now has morphed into a heroic-sized horse and rider constructed of polyurethane foam. The work in foam is a precise enlargement of the maquette, right down to the horse’s eyelashes beneath his checkered blinkers. 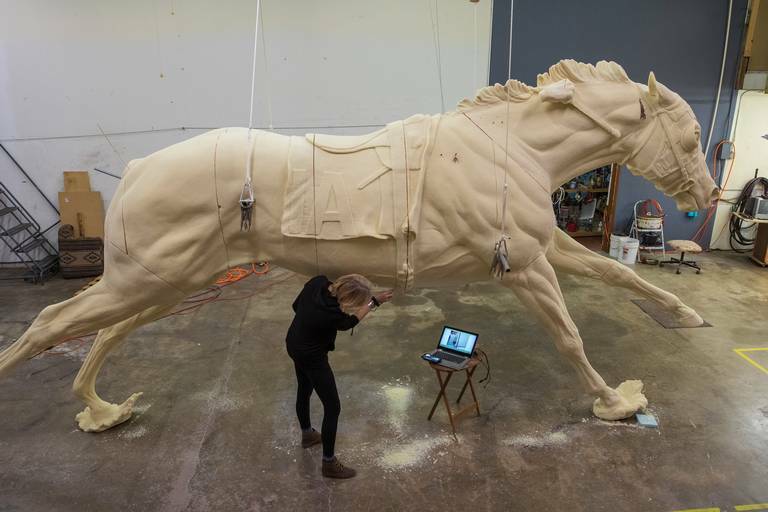 Synappsys Digital Services in Norman milled horse and rider from chunks of foam according to measurements dictated by a 3-D scan of the clay maquette. By mid-December, Russell and Dubail had assembled the foam chunks into a recognizable Secretariat and his rider. These foam constructs, with a covering of clay, will be disassembled into 35 or 40 pieces during 2019 to build molds for the pouring of molten bronze that will result in the monument’s final version. Russell and Dubail were ready to begin covering the foam with brush strokes of hot clay when Campbell visited Dec. 12 to check on the sculpture’s progress. 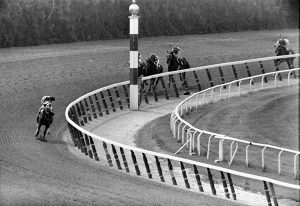 Jockey Ron Turcotte, aboard Secretariat, turned for a look at the field as they made the final turn on the way to winning the Belmont Stakes and the Triple Crown in 1973. The bronzing will be completed nearby the studio at a foundry called The Crucible. 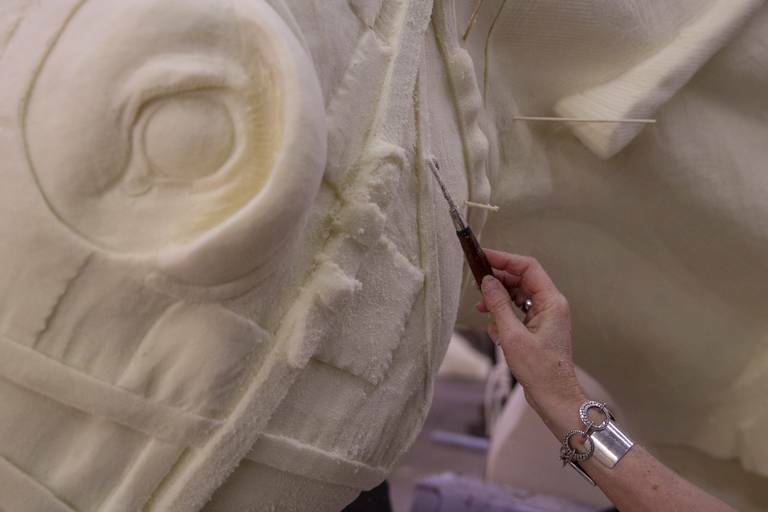 After each mold is poured with bronze, the sections will be reassembled into the final version of the monument. “I say it’s fine art at its finest because they’ll take sledge hammers and jacks and all kinds of things to force metal into position and make it fit,” Russell said with some humor. 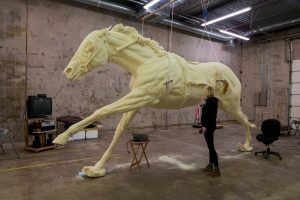 “I have to walk away when they do it: that’s fine art, I ask?” The bronze horse and rider will be about three-eighths of an inch thick and hollow inside, as are most large bronze memorials.